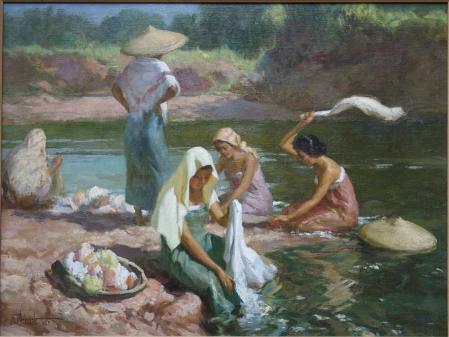 Fernando Cueto Amorsolo was active/lived in Philippines. Fernando Amorsolo is known for Philippino landscape, wartime scenes and portrait painting. Seller's Notes/Description: Very fine example of a typical lavandera scene at a riverbank. These kind of scenes have all disappeared in and around the city, but further out in the provinces you can still view traditional life such as depicted here. This painting purchased in 1945 directly from the artist and passed within the family to the present owners. Douglas Frazer Fine Art, Ltd.